It's said that each continent or element has its own biggest animal, which are so attuned, or incredible, that they function outside the normal workings of living creatures. Hillers are considered the embodiment of the powers of the earth, and thus to be Lozirian animals, although there are some in Sawa as well, and nobody knows what hides under the canopy of Gdera's forests. "Some of the hiller tribe spoke to the hiller by waving flags. They said they used them to talk about which way to go, but from what I saw, their conversation was much deeper than that." It's said that they are born under mountains, and when they are big and strong enough, lift the mountain up and walk away. 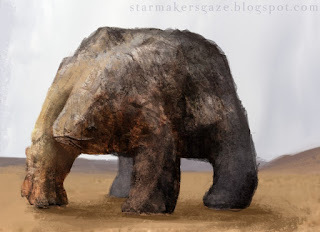 Their gargantuan bodies are covered with rocks and sediment, and they are big enough to house a large tribe. Hillers move very, very slowly, nobody knows what they eat, and there's barely a way of communicating with them, although those who live on them can tell if the hiller is happy, sad, or calm. Hillers seem to generally enjoy the company of humans, especially when they decorate their mobile home. The original German name is Berger, which would translate to mountainer, but it lost its whimsicality in the translation, and I went with hiller instead. Walking mountains are a wonderfully fantastic idea, and they make several appearances in Genius Loci. I haven't even invented all biggest animals yet, but the horr in the seas and the clouders in the skies are of similar incredulity. Spirit collectors can work entirely without tools if needed, but prefer using them. 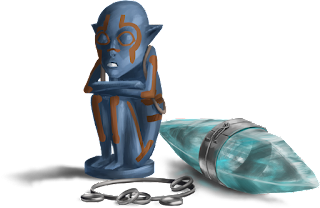 They're usually made by pendulors, and totems and tubes need to be of certain quality - broken totems release their spirits. The wooden totems are for trapping dead spirits. They are blue at first, turning brown when inhabited, and are painted with spirit-bonding patterns. The figure is sitting with folded arms, and must be of the appropriate species; a rope can be pulled through for hanging them up. In the cleansing rituals to unite the dead with the Great Spirit, the totem is destroyed. "It was custom for collectors on their way to the cleansing to wear blue as a warning. Crowds parted around them, but more than once, the rebels shot them to release all spirits in the masses, causing great turmoils." Spirits are reflected like light and cannot escape rings, going in circles forever. Echo tubes are therefore made from mirroring materials. They can be glass tubes that are screwed shut or crystals closed with clasps, while metal tubes are not commonly used - since there is no light inside, there's also no reflection, and supposedly this makes them less useful. "And when they had reached the clifftops, they started throwing down items we took for bottles, that shattered on the ground, but we soon realized in horror that they were echo tubes releasing their spirits among us." The collectors' rings also use the ring principle. Young collectors start with them on arms and legs, moving them outwards gradually. A collector's body is a vessel, every inch makes room for more and greater spirits, and the rings are like stoppers. Seasoned collectors wear their rings on toes and fingers. Needless to say, there are also legendary collectors' rings or echo tubes that supposedly work better than the average. I always liked all the precautions you are supposed to take when interacting with the supernatural - turning mirrors to the wall, guarding thresholds with brick dust or salt, and so on. With equipment, there's also the storytelling element of precautions gone wrong, to add danger and difficulty to the task.